This recipe is a quick fix side that is typically eaten as part of a South Indian meal, typically Tamilian South Indian meal. It can be made in one of many ways. I keep it simple..no extra, fancy ingredients, just the basics to allow the nutty texture of the lentils and the goodness of the greens to be pronounced. 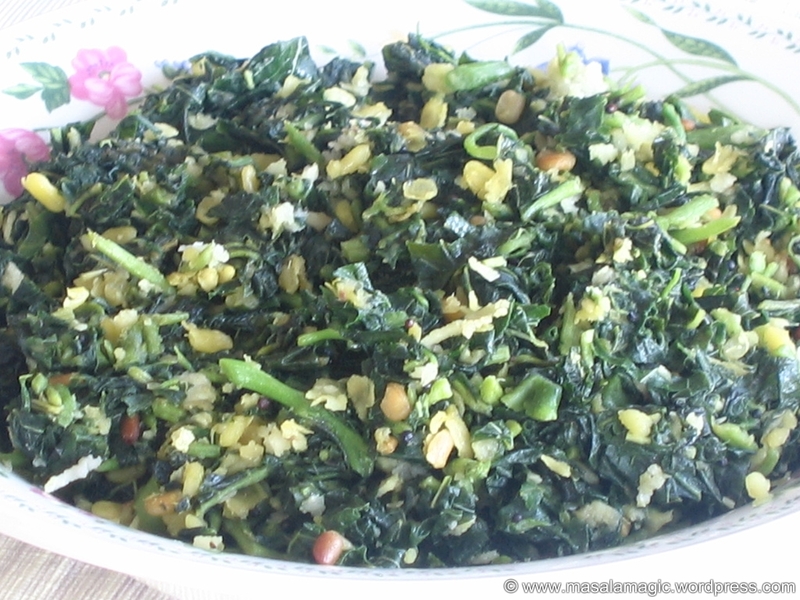 You can use any greens in this recipe – I mostly use either Spinach or Amaranth Greens (Thotakura, Dantina Soppu or Tandu Keerai) in this recipe. 1. Heat about 5 cups of water in a saucepan. When the water is hot add the moong dal into the hot. Cook the dal until almost done. This will take a good 15 minutes or so. Use a wooden spoon to stir. The moong dal has a tendency to allow the water to boil over and cause a big mess if you are not careful. 2. Once the dal is cooked, drain the water and keep aside. 3. Heat the oil in the pan. Season with mustard seeds. Allow to splutter. 4. Add the other seaosning ingredients. After 2 minutes add the chopped green chillies and the chopped greens. 5. Add the turmeric powder, salt to taste and mix well. 6. Add about 1/2 cup of water and cover with a lid. 7. Cook until all the water is evaporated and the whole mixture is almost dry. 8. Garnish with grated coconut and serve hot as a side to rice and sambar/dal. I also like to use this as a filling for sandwiches when I have leftovers. It works great!